Ponkan tangerines are large for a mandarin, measuring an average of 7 centimeters in diameter. They have a characteristic short collar, or neck, at the stem end and a flattened base. The medium-thick rind is a light orange in color and has a smooth to pebbled texture with prominent oil glands. The aromatic skin adheres loosely to the orange-colored flesh and is easy to peel. They have a tender, juicy flesh that easily segments and offers a melting quality with few seeds. Ponkan tangerines have a sweet flavor balanced by low levels of acidity. Ponkan tangerines are available in the late fall through mid-winter months. Ponkan tangerines are one of the oldest known and most widely grown, mandarin varieties. They are known as Nagpur suntara in India and Batangas mandarin in the Philippines and are often referred to as Chinese Honey orange. Ponkan tangerines are botanically classified as Citrus reticulata and are considered one of the more “tropical” mandarins. They grow best in warm, humid conditions. 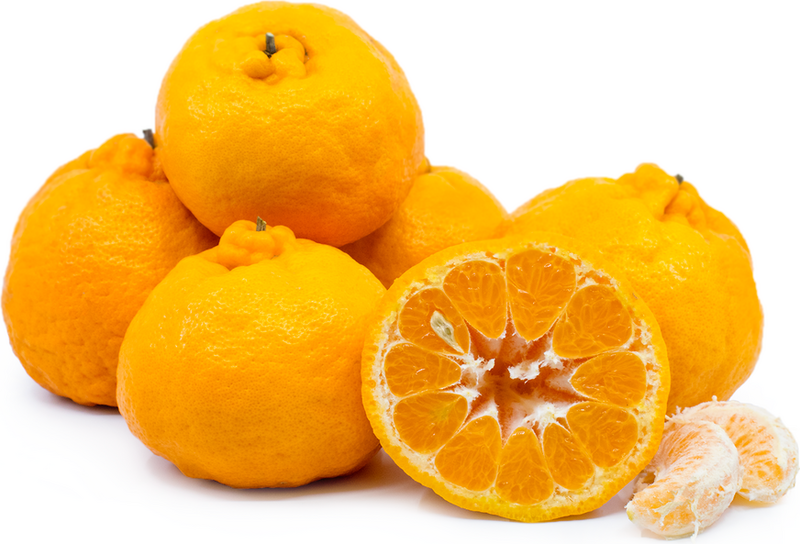 Ponkan tangerines are high in vitamins A and C, B-complex vitamins, potassium and folate. They are a good source of carbohydrates, calcium, copper and magnesium, and contain iron and vitamin E. They contain flavonoids and the carotenoids lutein and zeaxanthin, which offer antioxidant benefits. Ponkan tangerines can be used raw, juiced or used in cooked applications. Add them to green or fruit salads, salsas or relishes. Use the juice for beverages, marinades or dressings, or for glazes, curds or desserts. Ponkan tangerines pair well with strong cheeses, bitter greens, mint, and chocolate. They complement pork, poultry and seafood. The zest can be used in baked goods, smoothies, marmalades, and as a garnish. Store Ponkan tangerines in the refrigerator for up to two weeks. Ponkan tangerines were first sent to the United States from a medical missionary in China. Subsequent seedlings were grown and found their way to Robert G. Pitman of Apopka, Florida. Pitman spent years improving the variety, eventually securing a patent for his “new” fruit. In 1948, the same year the Ponkan was patented, Pitman established the Florida Ponkan Corporation. It went on to become one of the largest and most influential citrus nurseries in Florida and was the only source for Ponkan trees in the United States for decades. Two varieties are commonly found in Florida, the Oneco and Warnurco tangerines. Ponkan tangerines are native to India, where they were cultivated for centuries in the southern district of Kodagu (Coorg) and in the northern states of Assam and Sikkim, as well as in Nepal. They were well-known throughout Southern China and Taiwan and were introduced to Europe around 1805 and to the United States by 1892. Ponkan tangerines are also grown in Brazil making up 41% of the citrus production there. They can be found growing in South Africa, Australia, and Italy. Ponkan tangerines trees are alternate-bearing, which means they tend to produce most of their fruit every other year. For this reason, they are not widely cultivated for commercial use. Ponkan tangerines may be spotted at farmer's markets or specialty stores.